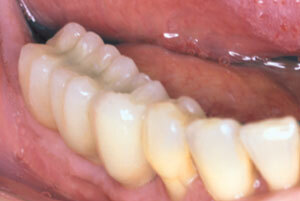 Dental implant treatment is considered standard of care and is also the preferred method of replacing partial dentures. Numerous studies in the scientific literature demonstrate that the long-term success of dental implant-supported replacement teeth is significantly higher than partial dentures. In addition, studies also indicate that patient satisfaction is much higher with replacement teeth that look, feel and function like natural teeth. 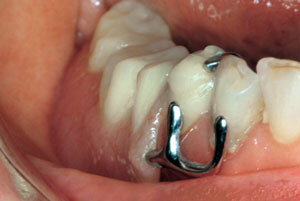 Implant-supported crowns and bridges maintain proper overall bite and function of the teeth and jaw joints. 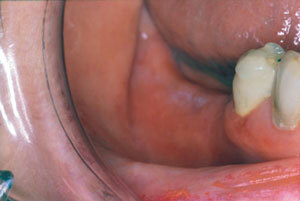 Dental implant treatment prevents bite collapse and malpositioning of the teeth. 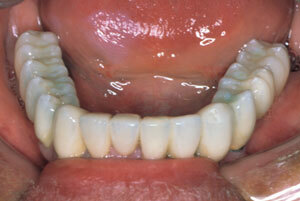 A sense of confidence is also restored with the stability of implant-supported replacement teeth. The following photos illustrate how dental implant treatment can replace a partial denture with stable replacement teeth that are more like natural teeth.